The Supreme Court would today, give the final word whether Rev. Chukwuemeka Ezeugo, alias Reverend King should be hanged for murder or whether he should spend some few years more in jail. King, General Overseer of the Christian Praying Assembly in Lagos, is challenging the judgment of a Lagos High Court sentencing him to death by hanging. General Overseer of the Christian Praying Assembly, Rev. Chukwuemeka Ezeugo, a.k.a Reverend King The apex court presided over by Justice Walter Onoghen adjourned till today to give judgment after listening to arguments from counsel to prosecution and defence in the matter. Lagos State Attorney general and Commissioner for Justice, Mr. Adeniji Kazeem, who appeared before the Supreme Court alongside Mrs. Idowu Alakija, the Director of Public Prosecution and other Senior Counsel in the State, urged the court to dismiss the appeal and uphold the judgment of the lower court. 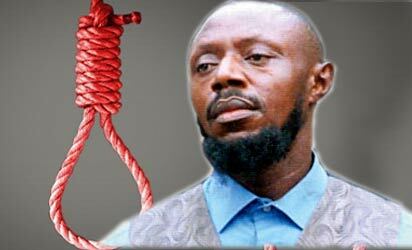 Ezeugo was arraigned on September 26, 2006 on a six-count charge of attempted murder and murder. He pleaded not guilty to the allegation but was sentenced to death by the then Justice Joseph Oyewole of Lagos State High Court, Ikeja, on January 11, 2007 for the murder of one of his church members, Ann Uzoh. Justice Oyewole is now a judge of Appeal Court sitting in the Calabar division. The Lagos State Government had said that the convict poured petrol on the deceased and five other persons and that Uzoh died on August 2, 2006; 11 days after the act was perpetrated on her. Ezeugo was convicted and sentenced to 20 years imprisonment for the attempted murder and death by hanging for the offence of murder. Dissatisfied, Ezeugo challenged the verdict before the Court of Appeal in Lagos, but the appeal was thrown out. “I hereby rule that the prosecution effectively discharged the burden of proof on it. This appeal is devoid of any basis and accordingly fails. “The judgment of the High Court is hereby affirmed, and the conviction imposed on the appellant, (which is death by hanging) is also affirmed,” Justice Fatimo Akinbami who read the judgement held. The two other members of the panel of Justices, Amina Augie and Ibrahim Saulawa concurred with the lead judgement. Again, Ezeugo not being satisfied with the verdict, approached the Supreme Court, and urged that the judgment be upturned. The apex court has now fixed the final judgment for today.